Everyone has their own recipe for cooking a beer can chicken. I like to inject mine with a little Cajun seasoning because it keeps the internal meet moist and provides excellent flavor. 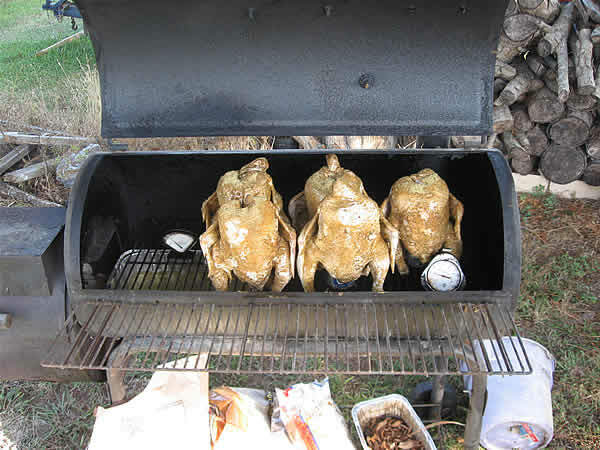 The idea behind the beer can chicken is that the liquid in the beer can heats up and cooks the inside of the chicken while the outside is cooking. It helps the chicken to cook a little faster while keeping it moist. I like to add a few spices, especially garlic, to the liquid in the beer can to add a little flavor when the liquid starts to boil. One tip is to make little foil wraps over the ends of the chicken legs to keep them from burning. They will be closest to the fire when the chicken is on the beer can and cooking. 2. Tony Chachere's seasoning to cover the outside of the chicken. 1. Whisk all injection ingredients together. 2. Using a kitchen syringe, inject the liquid into various spots on the chicken. Try to be even as possible, injecting about 1/2 of the mixture into the breasts, and the other 1/2 throughout the rest of the chicken. 3. Rub the chicken down with olive oil, and apply an even layer of Tony's Cajun Seasoning to the bird. 4. Drink half of the beer, widen the opening at the top of the can, then put the garlic and onion in the can. 5. Place the bird on the can. It should sit up by itself. You may have to prop the legs forward to make it sit up. 6. Preheat your smoker to about 250 F degrees. I use hickory for chicken; charcoal works well too. 7. Mix the mop ingredients in the spray bottle and shake before each use. 8. Put the chicken on the smoker and spray the chicken with the mop about every 30 minutes to keep it moist. 9. Smoke the chicken for 3-4 hours, or until the internal temperature of the thickest meat reaches 175 F Degrees, and juices run clear.